DESCRIPTION The MK393-H photo-movie kit is designed to maximise compactness and stability, ensuring a durable shooting experience thanks to the high quality materials. This tripod-head system has an integrated compact head with a quick camera attachment for precise photo and video shooting. 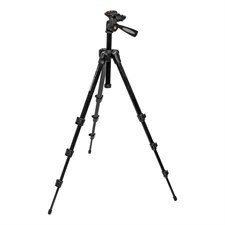 The tripod is made of intermediate aluminium tubes to ensure lightweight and compactness. The legs, thanks to a new designed selection system, can be independently set in two different angle positions. The product also comes with a convenient bag for packing and transportation.